Sting's Summer 2012 Tour made a stop in Atlantic City, NJ this past weekend. 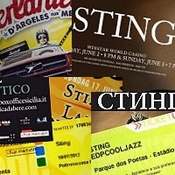 Metro New York wrote, "Just one song into the set and it was more than clear why Sting is a music legend who is still selling out shows across the world." Check out this video filmed in the beachside locale and don't miss Sting and the band on tour throughout Europe beginning this Saturday, June 16! Sting ROCKED the Borgada Saturday night. He continues to be the consummate professional who respects his audience while he makes it impossible to stay in your seat one minute and start looking for a Kleenex the next. Not sure if I will ever experience the heights of his talent in my lifetime. I was there and I had a fabulous time. Another really great show. And, we loved the Borgata hotel. What a great place for a concert. We spent the night at the hotel and made a lovely weekend of it. Thanks for a great time Sting!